The news media today are full of references to globalization - the complex connections between different countries in the world and the way these are increased over time. It is becoming a contemporary cliche that we live in a world of globalization, but little attention is paid to how it actually works in people's lives. A Globalizing World? 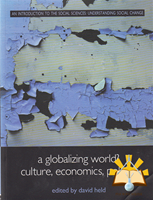 offers a clear and intelligible guide to one of the key debates of our time, introducing the main theoretical positions to examine globalization in practice, from the films we watch to the jobs that are available to us and the goods we buy to the way we are governed. Een succesvol bedrijf zal moeten werken volgens het model van de klant. Een dienstverlenend bedrijf verdient haar geld met, en ontleent haar bestaan aan, het oplossen van problemen van klanten. Wat de auteur in dit boek wil benadrukken is dat hieruit niet zonder meer volgt dat de klant de almachtige koning is. Werken volgens het model van de klant betekent niet dat de klant met een 'U vraagt en wij draaien' mentaliteit de dienstverlener kan dwingen tot het leveren van kwaliteit en tot het oplossen van zijn problemen. Dan cijferen we onszelf als dienstverlener weg en slaan we te ver door naar de positie van de ander. Een dienstverlener die zichzelf wegcijfert en die daarmee het geloof in eigen kunnen niet meer uitstraalt, kan onmogelijk kwaliteit leveren. 'Alles over verkopen' biedt een groot aantal gouden tips voor beginnende en ervaren vertegenwoordigers en iedereen die met verkoop (en inkoop!) te maken heeft. van praktische managementvaardigheden zou kunnen worden. Contemporary purchasing & supply management issues in the aerospace industry An average company in the aerospace industry spends two-thirds of their costs at suppliers. This implies that selecting and managing suppliers is of crucial importance to achieve success with respect to cost but also quality, delivery performance and innovation. Purchasing & supply management has many relations with other business processes. Understanding this area is therefore important for aerospace business. The aim of the hook is to encourage application of fundamental concepts, models and instruments in the area of purchasing & supply management in the aerospace industry. The chapters have been written by students as a part of a 'Purchasing Management' course. Many of the chapters have already been presented at conferences. Therefore we feel that the book could he of great interest to anyone wishing to keep track of developments occurring in the field of purchasing management in the aerospace industry. Alle bankiers in Nederland tekenden onlangs hun nieuwe beroepseed. Het doel daarvan: het terugwinnen van het geschonden vertrouwen. Maar waarom is de beroepseed voor bankiers dan het best bewaarde bankgeheim van 2010? Is er echt sprake van een cultuurverandering in de bankwereld? Of was de bankierseed slechts een zoenoffer aan de inmiddels verdwenen minister Bos, die de banken gered heeft? Wat stelt de beroepseed voor bankiers eigenlijk voor? Aan wie is hij gericht? Wie ziet toe op de naleving? Oud-bankman en publicist Hans Ludo van Mierlo beschrijft op heldere en onderhoudende wijze wat de bankiersverklaring is, wat ze niet is en wat ze nog kan gaan betekenen. Hij weet zijn publiek te prikkelen én te overtuigen. The international lending spree of the past two decades has had grim consequences: billions of dollars worth of bad loans which have seriously weakened some of the world's leading financial institutions—and a drying up of credit for the very countries that need it most. Conventional wisdom holds that Eastern European and less developed countries will now have to depend on governments and international bodies like the World Bank and the IMF for financing. This important book, the first comprehensive account of the interna-tional debt crisis, argues that private banks can and must continue to play a role—but only after basic weaknesses in both the borrowing institutions and the lending banks are addressed. Based on-fresh, original research as well as on revealing interviews with key partici-pants—cabinet members, bank CEOs, Federal Reserve governors, bank examin-ers, and others—Lissakers' eye-opening book helps us to understand why both the banks' own internal controls and the gov-ernment bank regulators promoted rather than restrained the lending. She shows how hidden tax subsidies by the U.S. gov-ernment, as well as by other industrialized countries, made loans to developing coun-tries unrealistically profitable and, in the long run, fragile. The author shows that internal political pressures rather than external balance of payment pressures drove the level of sovereign borrowing. And she explains how the conflicting pri-orities of banks, borrowers, and the inter-national political establishment unneces-sarily prolonged and deepened the debt crisis. Lissakers concludes that if the lessons of the last two decades are taken to heart, a healthy and vital relationship between banks and developing-country borrowers can emerge from the rubble of the interna-tional debt crisis. Her book provides an invaluable guide to the recovery of inter-national lending. A national consultant on public speaking helps readers become confident orators by overcoming their fear of attention, cultivating genuineness, developing a sensitivity to their audience, and basing their speech on four key components. Tour.